Even though poetry is something I’ve not attempted to review in the past, I read it regularly and know what I like, and what I don’t like. I found there was much to like in the poems in Susan Austin’s Undertow. Austin’s poetry is frank, honest and accessible. Perhaps I’m a lazy reader, but I’ve never been a fan of the vague, the intellectual; the type of poetry that must be read and reread, and read yet again in the hopes of discerning just an inking of what the poet is writing about; the kind of poetry that leaves me with a headache and the uncomfortable feeling that I am more than a little stupid. Austin’s poetry is anything but the brain-bending kind, and yet that doesn’t mean it is all too obvious and boring. In fact there is much subtlety here. The subject and content of the poems varies, but all are created from the details – big and small – of everyday life; of love and loss and sadness; universal themes that we can all relate to as emotional human beings. Poetry’s power lies in its ability to get under our skin, to touch something deep within us, to remind us that we are all connected through our experiences. Anyone who has suffered from depression or debilitating inertia would feel an immediate connection with Austin’s poem ‘Couched’:. 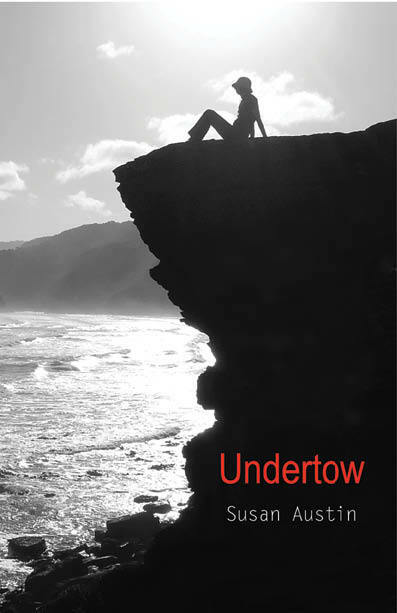 If, like me, you prefer poetry to be a warm and welcoming embrace, rather than something that keeps you at arms length, then you could do a lot worse than to pick up a copy of Susan Austin’s Undertow. These poems don’t wear gaudy colours or shout from the rooftops to be noticed. Nor do they attempt to confuse, or baffle. These poems hold the door wide and welcome you in. There is something for everyone in this collection. This entry was posted in Issue 8, Lisa Wardle, Susan Austin, Undertow, Walleah Press and tagged Australian Literature, Australian poetry, Australian Womens' writing, literature by Mark Roberts. Bookmark the permalink.